The Major Mitchell Centenary Cairn was unveiled at the entrance to Silvester Oval on the 7th August 1936 to celebrate 100 years since Major Mitchell passed through the Wannon Shire. A number of trees were planted to celebrate the event. COLERAINE, Monday-One hundred years ago Major Mitchell passed through the Wannon Shire There was a large attendance at Silvester oval when the Major Mitchell Centenary was celebrated. 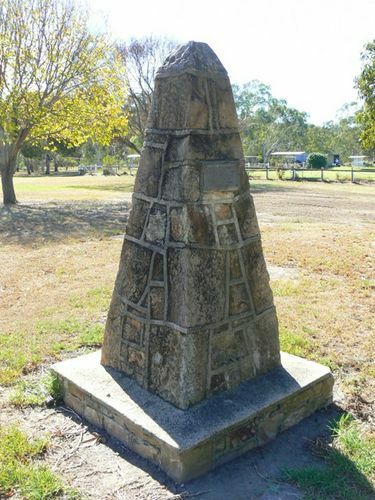 A cairn erected in memory of Major Mitchell was unveiled and an address on Major Mitchell`s tour through the Western district was given by Mr A G Turnbull Addresses were also given by the president of the Shire of Wannon (Councillor M Straede), the Mayor of Hamilton (Councillor Young), and the inspector of schools (Mr Richards). A number of trees were planted, the first by Mr J W Trangmar, one of the leading citizens of Coleraine, and Mr E Payne, the first white child born in Coleraine. Argus (Melbourne), 11 August 1936.